Perfect Time & Season to Visit : Monsoon between Mid June till September End (Better ignore during very heavy rains days). Known For : Hill station weekend gateway, Monsoon Destination, Waterfalls, Valley view. Distance from Mumbai : 120 Km, On Mumbai Nasik Agra Highway. Total Days Required For Sight Seeing : Within 2 days you can complete all sight seeing locations in and around Igatpuri. Vehicle Recommended : Yes, If coming via train, Autos available at station. Accommodation : Ample stay facilities in all range available. As i start sharing my own experience about Igatpuri sight seeing attractions, Those waterfalls, Scenic Valley, Lovely road drive experience at mesmerizing ghats of Kasara making me feel like visiting once again. Its just 2 days of fresh memories and i thought of expressing my excitement and important things to do and things to take care, avoiding few mistakes i made which will help you save some time and energy. 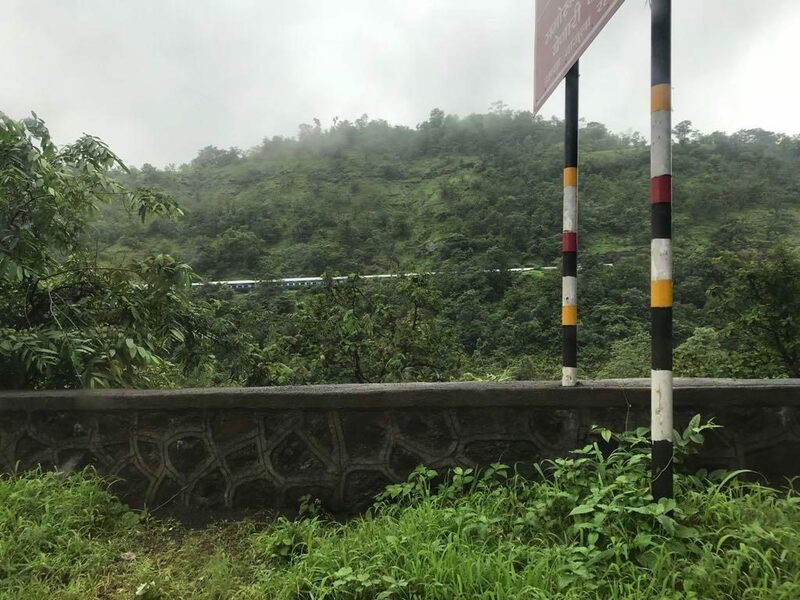 Since i am writing about this monsoon destination near Mumbai, for people visiting from city, I would like to detail all the attraction places in a particular order so that it will help save lot of time assuming it as a 2 days trip to monsoon heaven Igatpuri. Igatpuri is a hill station on Mumbai Nasik Highway (NH 160) merely 120 Km driving distance from Mumbai. The road after Bhiwandi is fun to drive in monsoon specially after you cross vasind. Lush green mountains with hardly any buildings or concrete around will welcome you with open arms. Great driving experience and picturesque location view will make you pull out your cameras to capture some initial memories even before reaching Igatpuri hills. IMPORTANT Note : To enjoy all attractions of Igatpuri in best possible way, I would highly recommend coming to this place via a vehicle. Nasik highway toll charges are Rs.105 for cars which i saved as i picked up a friend and went via Vajreshwari road that connects Vasind on Mumbai Nasik Highway (Not Recommended as roads are narrow and pathetic post heavy rains right from Vajreshwari temple all until Nasik highway) and that was bad 20 Km experience. Vihigaon Ashoka Waterfall : Also searched as ‘lake vaitarna waterfalls’. If lucky and no heavy rains, Ashoka waterfalls at Vihigaon village is first thing you should explore before heading towards Igatpuri. WHY ? Because Vihigaon is located just before the Kasara ghat starts. A road to Vihigaon waterfalls goes left and is recommended as then the distance to Igatpuri is 16 Km (One way) which is what time, petrol you can save if you plan visiting. Most important, roads are one way and once you come down the ghat and visit Ashoka falls, You need to drive up again to ghat and drive down towards Mumbai again. How to reach vihigaon waterfall : Keep your map app handy as you may miss a steep slope on left of the hilly ghat road with a small sign board that shows directions to Ashoka Waterfalls. 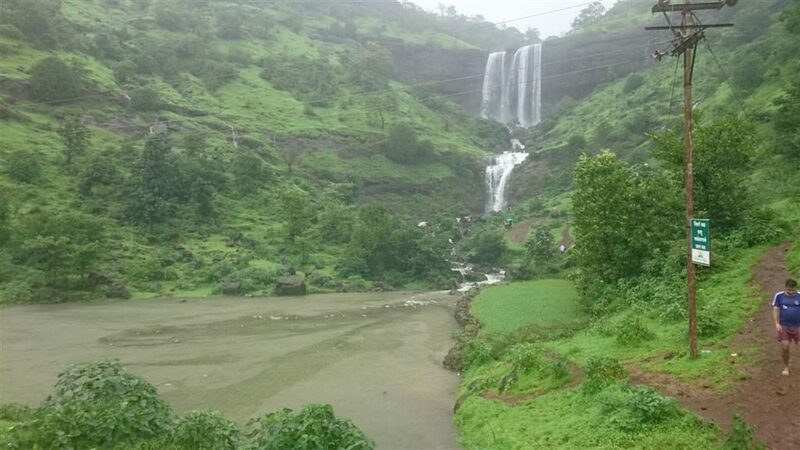 If you are lucky (not like me who missed Ashoka waterfalls due to restrictions / closed due to heavy rains) you will reach and enjoy the biggest waterfall attractions of Igatpuri trip. My bad luck was due to heavy rainfall of July, Police restricted entry to Vihigaon waterfalls till further safety updates (Mostly 31st July 2018). 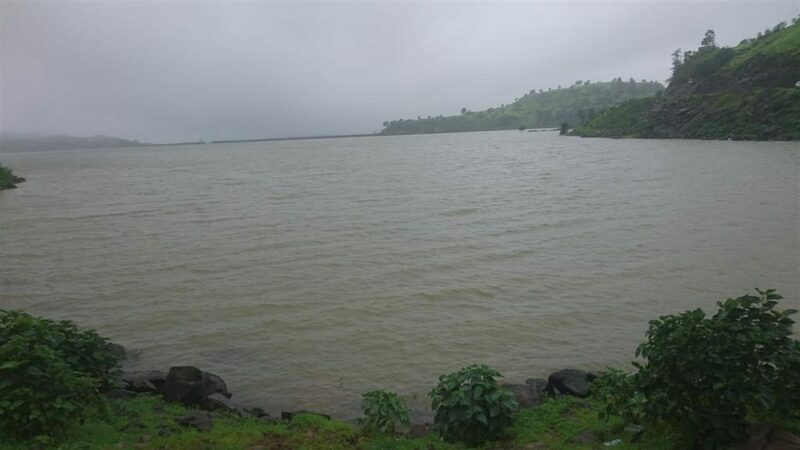 Thal Ghat, Kasara : Moving ahead on Kasara is ‘Thal Ghat’ which is the second attraction of Igatpuri. Frankly, nothing huge, just a scenic location best seen from long distance trains crossing Kasara as you are not allowed to stop vehicles and get down for some pictures etc. I was unaware of the fact that stopping vehicles on Kasara ghat road is not allowed, But lucky me as when we saw first tiny water fall along road side of ghat, we stopped by to get some pictures and so the Thal ghat picture on this page as captured. Police patrolling jeep keeps around and will not allow you to stop by. Camel Valley : After enjoying the Ghat drive you will finally reached the top at Igatpuri. Immediately the famous valley facing resorts like ‘Manas Resort Petting Zoo’, ‘Rain Forest Resort’, ‘Mystic Valley Spa Resort’ etc shows up. These are some of the known good resorts and hotels apart from many others which are not valley facing yet cost healthy with great service and facilities like ‘Hotel Ashwin’ near Mahindra’s, Just 2 Km all others. How to reach Camel Valley : It is a scenic location right on main road of Mumbai Nasik Highway as soon you complete ghat and reach Igatpuri. To be particular, it is near around location opposite of Manas petting zoo resort. See few hawkers like Sweet corn sellers and you can make out the location easily. It gives a beautiful deep valley view with a small waterfall and few springs inside the green valley. There is a single farm house bungalow seen on backside mountain of this valley which got famous as the news broke related to Pakistani actress ‘Laila Khan’ & Family who were brutally murdered. Myanmar Gate : 2 Km from Igatpuri railway station and not very far from Highway, i.e upon crossing a over bridge comes a beautiful yellow looking structure called ‘Myanmar Gate’, vipassana & meditation centre where one can learn meditation or as a tourist visit this picturesque gate for some selfies and can also spend few minutes inside the art gallery. There is no entry fee at this attraction place. Tringalwadi Dam and Fort : Apart from beautiful weather and waterfalls, Igatpuri has one main attraction for trekkers and hikers. The Tringalwadi Fort is one place to visit in monsoon if you are looking for some adventure and a hiking location near Mumbai. For those who do not want to climb the mountain, a beautiful dam in same location welcomes you for spending some serene time. Note that the pathway is muddy during monsoon and need to plan accordingly. Bhavli Waterfalls : Saved the best for the last, Bhavli waterfalls is the only must attraction NOT TO MISS if you are at Igatpuri in monsoon. Just 10.5 Km from Igatpuri railway station, Or 9 Km from Highway is Bhavli Dam with 2 beautiful waterfalls safe to explore. Both the waterfalls are 2 level on a hilly area and many do not know that there are 2 similar waterfalls destination not far from each other on same road. Many people just stop by at the very first waterfall which is more crowded due to very fact, Where as the second waterfall which looks all the very same is just a Km away and ahead on same road. The video you will see on this page is taken by me on second waterfall. Day 2 of our trip bought huge smog and heavy rains at Igatpuri and our plan to visit Bhavli waterfalls was unsure. So we decided to head to Nasik at about 50 km from Igatpuri to explore the famous ‘Sula Vineyard’ and ‘Trimbakeshwar Shiva Temple’. 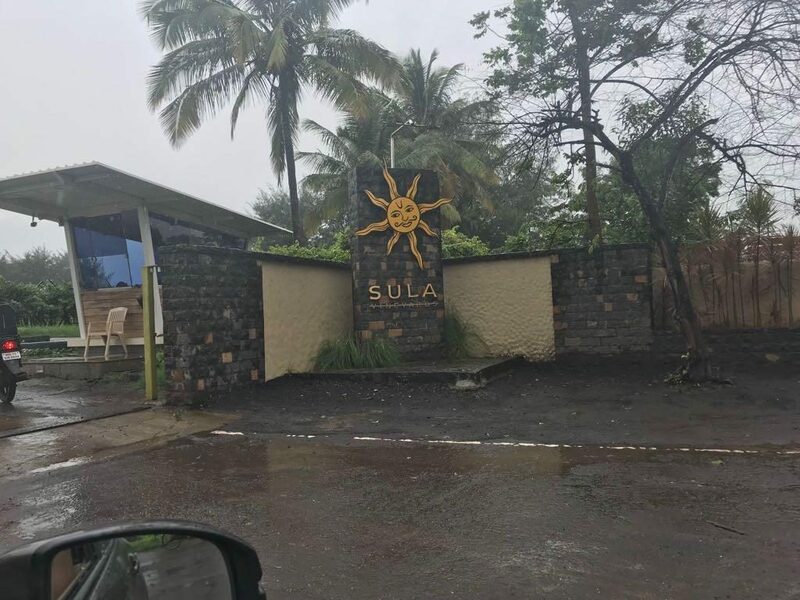 Sula Vineyard Nasik : We routed our map to Nasik for a great wine experience and reached ‘Sula Vineyard’. As they says, all for the best and if the heavy rain was not around we would have not explored nasik and were back to Mumbai without experiencing the famous Wine factory. Many knows Nasik is famous for its grape yards and nothing best than ‘Sula Vineyard’ experience which is just 55 Km from Igatpuri which takes hardly and hour. At Sula, one can taste wines and take 15 minutes tour that shows the wine making process. A special cafe for wine lovers on level one to enjoy beautiful green mountains and vineyard right in front sipping your favourite flavour of wine of some 30 to 50 varieties (Both White & Red). It was worth the time spent during Igatpuri monsoon trip as the rain was moderate here. Cover charges at main entry gate of vineyard is Rs.100 per person (Adults only) and can be redeemed by purchasing your favourite wine, No cash refund. Minimum cost per pint is about Rs.470. 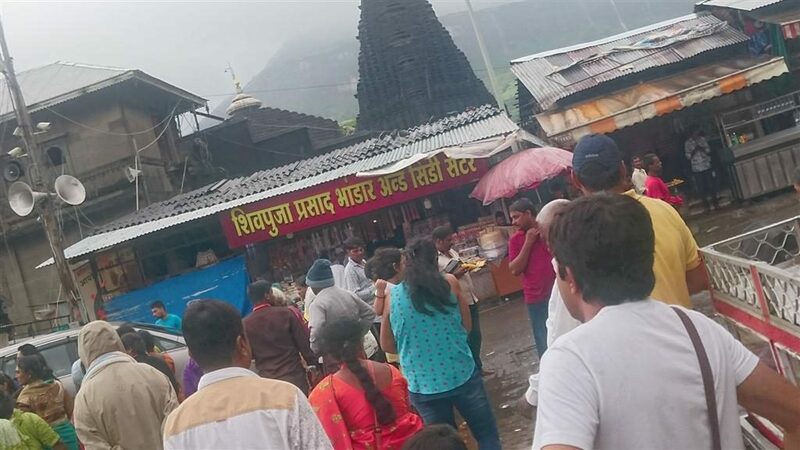 Shri Trimbakeshwar Shiv Jyotirling Temple : Another 22 Km inside Nasik is this oldest and famous Shiva Temple what we explored for some divine blessings. Few important things to note if you are visiting Trimbakeshwar for first time. Your car will be stopped at entry gate charging Rs.30 as some local tax and car parking. Then another person will approach at gate asking to pay Rs.150 to let you park your car near temple area, else need to walk about 500 to 600 metres to reach the temple. We ignored and went ahead (They directed us to take another route and not main gate). We thought it might be the way as barricades etc were on place. As soon we went, there was another barricade gate with a person asking same, for Rs.150 for all same stupid stuff. We were helpless, as 2 kids and a pregnant lady too, frustrated we decided to give Rs.150 to reach temple as it was raining too. As soon we took the route to reach temple we were surprised to see normal residency location, shops etc all inside village area. If we would have not said that we are visiting temple and here to visit some local, they would have allowed us to enter inside main gate. But this seems to be a way of earning which is really shameful. Another shock at temple was huge crowd and multiple rows of long queue to reach temple which took 45 minutes for Shiva linga darshan. Worst, Devotees are forced to move ahead within 5 seconds without proper darshan. I think, this is happening in most famous temples around India now. Earning method 2 : Direct entry inside temple for those willing to spend Rs.200 per person, Shiva Shiva Shiva. I thought it will be helpful for you if planning to visit Nasik like we planned from Igatpuri. Hope that helps you decide. Manas Mandir, A Temple at Asangaon (Near Shahpur) : 56 Km when back towards Mumbai is this Huge Jain temple called ‘Manas Mandir’ located at Asangaon (also referred as Shahpur Jain temple). I have always admired the serenity, simplicity and pleasant uncrowded environment of such jain temples and this is one of them. The premise is huge, neat and clean and sure to find some peace of mind. Manas mandir can be added as one of the on the way Igatpuri Attractions to your list. Rules at Manas mandir are strict, You cannot just walk inside the premise in shorts (Full Pants, Jeans etc must). Similarly for females, Dupatta is must. So if you just had fun around waterfalls of Igatpuri, keep a pair handy to get entry inside this jain temple. Canteen for tea, Coffee available and food too post 4:30 in evening. From Trimbakeshwar temple, DO NOT miss to take a beautiful road route of ‘Ghoti Trimbak Road’ which starts at Pegalwadi once out of temple and take right and if you planning to reach Igatpuri back. If you remember a song from DDLJ ‘Hogaya hai tujko toh..” and that road drive of ‘Switzerland’ which SRK drives while singing this song, Something similar experience i got and the trip was worth the hurdles at temple with Lord shiva blessings together. 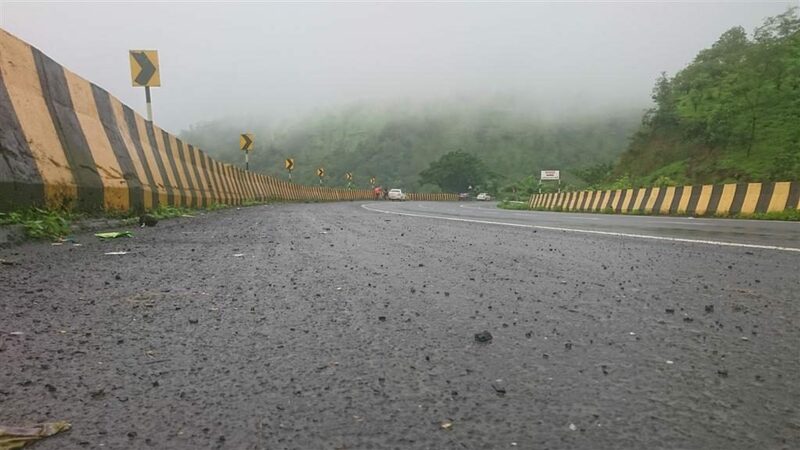 As already said Mumbai Nasik Agra roads are good and if you are one who like the zigzag ghat drive like me, Igatpuri by road from Mumbai is worth the experience. 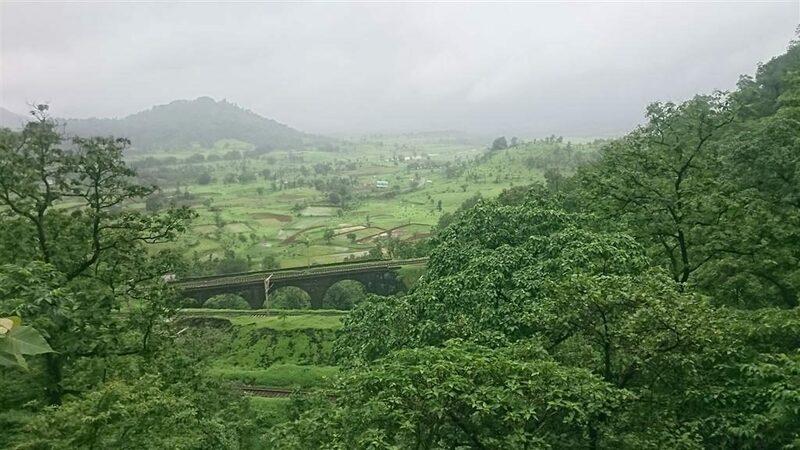 Kasara ghat which has Thal ghat view is one place you will sure enjoy. 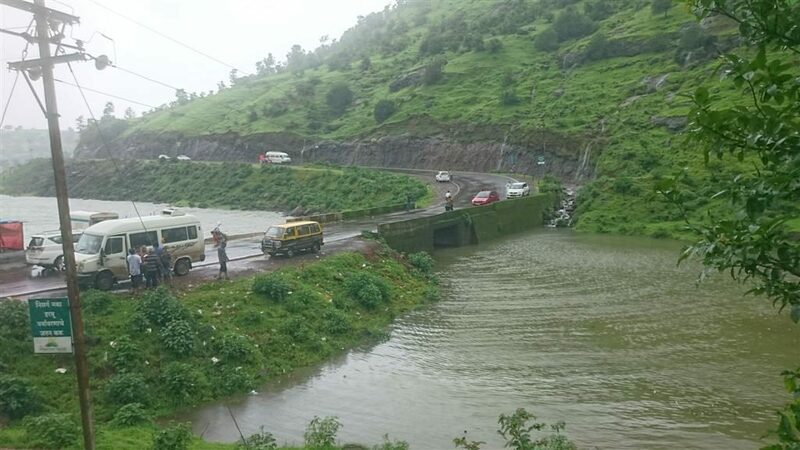 And then the roads from Igatpuri till Nasik was also a great experience during monsoon. 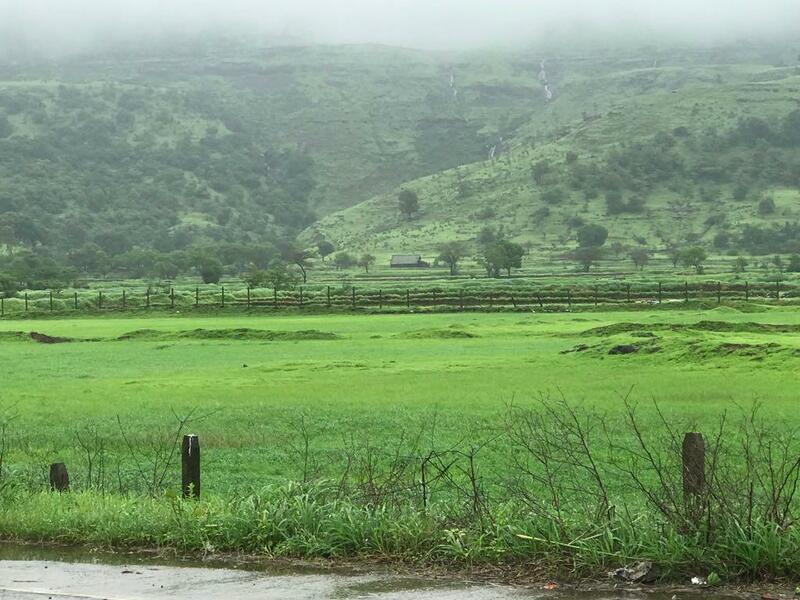 Overall a perfect monsoon destination and road trip near Mumbai.